Slush Brothers Cocktails and events. Ice van bar. Slush Bros can design a bar for you that will literally stand out from the crowd. 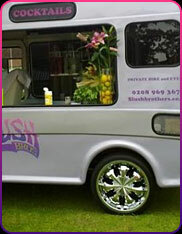 If your event needs the most unique cocktail bar in the UK then the Slush Bros Ice Van or simply the Slush Machines will give your clients and members of your team a great addition to a corporate event or party. Our cocktails are made only fresh fruit and premium spirits. Delivering them from our unique machines means that you are served premium cocktails of the highest standard. Careful consideration is given to accompaniments and glassware, and our professional bartenders are highly skilled in not just producing an excellent cocktail, but also creating a whole bar experience.